There is a giant map of the Arctic at the Museum of Nature. You can go check it out over the holidays and let me tell you: it's really cool. I got to see first hand the impact this map had on students' awareness and perception of the Arctic. It was impressive. When we think of the Arctic we think cold, snowy, and quiet. Those are some of the exact words students from a grade 5/6 class used in the beginning. After spending 20 minutes walking over the map and learning about the plants, animals, fossils and minerals found in the Arctic, you know how they described it? Vibrant, colourful, and alive. Just how the plant scientist who collected specimens there did. Their understanding of the great white North had completely changed. From December 26th to January 4th anyone visiting the Museum of Nature can take a stroll through the Arctic. 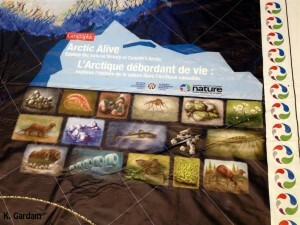 Five copies of this 8mx11m map and real specimens will spend 2015 traveling across Canada to schools where students will learn about the Arctic. 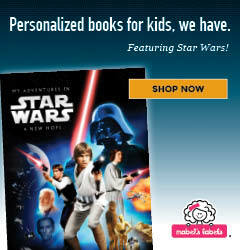 In fact, there are lesson plans available from kindergarten through grade 12. While you're at the museum I strongly encourage you to check out the special exhibit called Arctic Voices. There were lots of great hands-on things for kids, beautiful images, and interesting info. Arctic Alive! 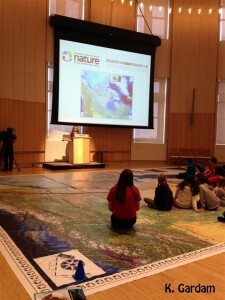 is a joint venture between the Canadian Museum of Nature and Canadian Geographic Education. The map and specimens will be available to the general public from December 26th to January 4th as part of the holiday programming at the museum. Disclaimer: I was able to check out Arctic Alive! and Arctic Voices free of charge. All opinions are my own.